i-Neighbour E-Billing is a feature in the Smart Community System that is implemented to assist both the Management and Residents within a neighbourhood in handling their invoices or any payments made. By utilizing this feature, the Management in the neighbourhood can provide invoices to the residents without having to physically mail them and residents likewise pay their fees via the smartphone. Before proceeding with this section, note that this particular module can only be configured by the Admin and in the Web portal of i-Neighbour. To configure the E-Billing Settings, please login to your Admin account at www.i-neighbour.com > E-Billing > Setting. Once in the overview, Admin will be presented with three tabs, namely General, Invoices, Collection Report and Account Statement. In General, Admins will have to fill up the necessary fields such as Currency, Auto Reminder and Bank Accounts. For Auto Reminder, note that more than 1 option can be selected in order to provide additional reminders for the residents. As for Bank Accounts, please start by including the Description for the payment, Bank Name and Account Number respectively for the system to link it to your i-Neighbour account. Note that Admins may separate up to a maximum of 3 different bank accounts for different purposes, i.e. Developer, Maintenance or Other Payment. Once done, please click on the Save button at the top right to confirm the action. In Invoices, Admins will normally be provided with 4 templates that can be specified accordingly. To edit the invoices settings, please click on the Edit icon located at the bottom of the respective invoices. After that, Admins will be presented with a pop-up to configure its settings, i.e. Template Name, Bank Account, Uploader, Approver and E-Invoice Configuration. Note that Admins will have to specify the Uploader and Approver when setting up the invoices; please also be informed that Uploader and Approver cannot be the same individual to reduce any errors or tamperings from arising. Once everything has been filled up, please click on the Save button to confirm the action. In Collection Report, Admins can also specify its settings by clicking on the Edit icon located at the bottom of the respective collection report. Once clicked on, a pop-up will be displayed for the Admins to specify the settings such as Statement Name, Uploader and Approver. Please click on the Save button after completing it to confirm the action. 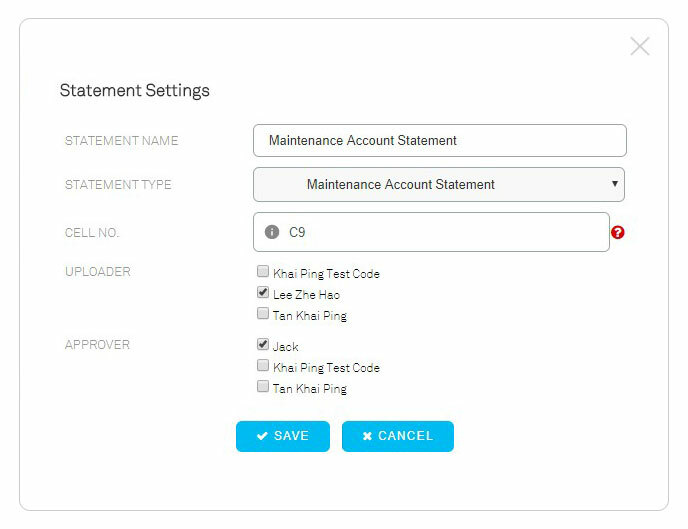 In Account Statement, the same can be done as well by clicking on the Edit icon located at the bottom of the respective account statement. Similarly, a pop-up will also be displayed for the Admins to specify the settings such as Statement Name, Cell No., Uploader and Approver. Note that Cell No. refers to the location of the cell number within the Account Statement Excel Sheet, which allows the system to capture the resident’s Unit No. Lastly, please click on the Save button after completing it to confirm the action. To import an invoice, please proceed to E-Billing > Invoices. Once in the overview, please click on Manage, then Import Invoices. Admins will then be directed to Import Invoices page whereby they can proceed to upload the invoice into the system. Note that only selected Admins will be allowed to upload the supposed invoices. From this point, Admins can select to upload their own template provided by a third party software or the Excel template provided by the system (Note to fill up the template with the necessary data before uploading it). Once selected and uploaded the file, please click on Next to proceed. Next, Admins can also select which uploaded invoices that they wish to attach an additional document on (Note that only a maximum of 5 documents are allowed). Once done, please click on to proceed to the Preview page. After confirming the details, click on Submit to confirm the upload for approval. Uploaded invoice will be labelled as Pending For Approval until the selected Admin approver has confirmed the supposed invoice. To start reviewing the invoice, please click on Pending Invoices located beside the Manage button under the Invoices overview. From here, not only will Admins be provided with a list of pending invoices but the Admins can also select to Approve or Reject the chosen invoices by clicking on the respective functions located below. 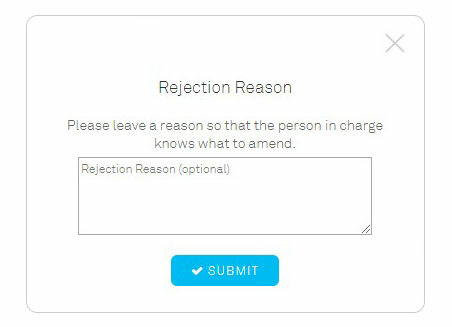 If rejecting an invoice, it is recommended that Admins include the reason for rejection. This is to allow the other Admins to be notified of the reason via the Dialog icon and better amend the issue. Note that Admins can also amend the rejected invoice by clicking on the Edit icon and subsequently approve it. A pop-up will then be displayed for the Admins to fill up. Admins should indicate the Payment Date, the Amount Paid as well as the Reference No. for the payment. After filling in the necessary fields, click the Save button to add the payment into the i-Neighbour system. Note that the admins will still have to knock off the amount; otherwise the balance in the resident account will not be updated. If residents would like to pay for Other Payment, please proceed to E-Billing > Other Payment > Receive Payment. Once clicked on, a pop-up will be displayed for the admins to fill up. Admins should then indicate which resident is making the payment, payment mode as well as include a remark to better inform the supervisors of the payment made. After filling in the necessary fields, click the Save button to add the payment into the i-Neighbour system. To view the invoice, please login to your account at www.i-neighbour.com > E-Billing. Once in the overview, residents will be provided with a list of invoices that are issued to them thus far. By clicking on the respective invoices, residents can even obtain more information from the pop-up displayed such as Attachments, Payment Details and etc. To make a payment in i-Neighbour, users can proceed to login to their account at www.i-neighbour.com > E-Billing. Once in the overview, please click on the Bill icon located beside the invoice that you wish to pay for. 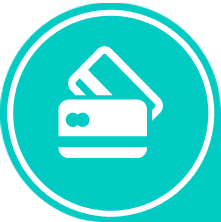 Otherwise, users can also click on the Make Payment button located at the top right and select Invoices or Other Payment. Next, please ensure that you’ve selected the invoices that you wish to make a payment a the system will automatically add up the amount. Subsequently, select the Pay button to proceed with the payment process. Users will be taken to a banking page whereby they can make the payment via their Credit, Debit Card or Online Banking. For Other Payment, please note that this payment section is implemented for users to pay for bills other than the invoices. Otherwise, please include the necessary fields such as Description, Amount and Email Address to better inform the Admins regarding the fees that you intend to pay. Once done, please click on the Continue button to proceed with the payment process. To make a payment in i-Neighbour App, users can proceed to login to their account at the Mobile App > E-Billing or More > E-Billing. Once in the invoice overview, users can tap on the Bill icon located at the top right of the page to begin the payment process. After tapping on it, users will be directed to a page that displays a list of invoices that requires payment. As such, please click on the invoices that you wish to pay for and the system will likewise add up the amount for reference. Once done, tap on the Pay Now to proceed to the banking page in order to complete the payment process. To view the Account Statement, please login login to your account at www.i-neighbour.com > My Account > E-Billing > Account Statement. Once in the overview, users will be presented with a list of account statement issued to them thus far. Tap on the View icon to receive more details about the selected account statement. 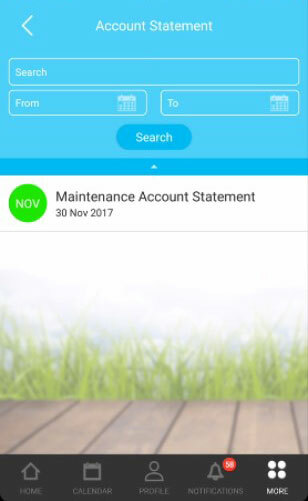 To view the Account Statement, please login to i-Neighbour App > More > Account Statement. Once in the overview, users will be provided with a list of account statements issued to them thus far. Users can then proceed to view the account statements by tapping on the supposed invoice. 1. I notice that there are only 4 templates when configuring the settings for the Invoices. Is there a way whereby I could add in my own customizable template? As of now, self customizable template feature is not available within the system. However if necessary, admins may contact us as well as send a copy of the sample template that they wish to utilize for us to include into the system. 2. While uploading the Invoices, I realized that the uploaded Invoices are unable to proceed due to some errors. How should I amend it? If an alert message is prompted, this issue is most probably caused by Clashing Lot No. or Unit No., Invalid Date Format, Invoice No. Left Empty and etc. To solve the issue, kindly amend the Excel file and re-upload it again. 3. After the Invoices has been uploaded, the system will then allow the attachment of additional documents. As such, can I attach different documents for each of the units? And what is the supported document format? Unfortunately no, all units will be attached with the same set of documents. The supported document format will be .doc, .docx, .ppt, .pptx, .txt, .pdf, .xls, .xlxs, .png, .pneg, .jpg, .jpeg. Note that only a maximum of 5 attachments are allowed. 4. I have been assigned as the Approver and have rejected one of the Invoice due to the errors made in the Balance Amount. How should the Uploader amend it? Is it necessary to re-upload the Invoice for the particular unit again? Once the uploaded Invoice has been rejected due to errors, the Uploader will in turn be allowed to edit the Invoice details without having to re-upload it. As an Uploader, kindly proceed to Pending Invoices > Rejected Invoice > Edit. Once done, the Approver will then be able to view the edited Invoice and proceed with the approval process. 5. I realized that the Company Name has been mistakenly named in the E-Invoice Configuration after the Invoices have been uploaded. Will this be reflected in the uploaded Invoice after I’ve edit the Company Name? Yes. Once corrected, all the details will be updated accordingly even though the Invoices have been uploaded. 6. What does Collection Report mean? In certain situations, residents will submit their Invoice payment through Walk-In or Bank Transfer without using i-Neighbour Payment Gateway. Admin is therefore allowed to compile all the Payment details and upload it to i-Neighbour as Collection Report. The System will then capture the Payment details and proceed with the Balance Amount deduction for that particular Invoice automatically. 7. I have uploaded the Collection Report successfully, but the Balance Amount of that particular Invoice is not updated. What is the cause of this issue? The uploaded Collection Report will be required to go through the approval process before the amount is updated. Kindly ensure that the Invoice details such as Invoice No., Unit No., Resident Name and etc are correctly matched as in the Collection Report. 8. 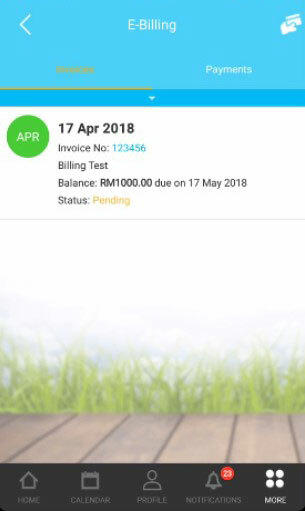 Each time I received payment from the residents paid through Other Payment, I noticed that the balance amount isn’t updated even after I’ve added the payment. May I know is this what the system intended or do I have to manually update it? Other Payment is meant for payments made other than Invoices, such as Facility Booking Fees, Event Registration Fees and etc. These payments will not be updated in the uploaded Invoice. For Invoices payment, kindly proceed to Invoices > Selected Unit > Invoice Payment. 9. Is there a reason why I could not access the payment module via i-Neighbour App or will this feature be implemented into the feature? You have to subscribe with i-Neighbour’s Payment Gateway in order to proceed with this feature. Otherwise, you will only be allowed to upload the Invoices, Collection Report and Account Statement for viewing and recording purpose only. Note that if the whole E-Billing module has been disabled through Module Settings, you will thus not be able to access the feature. 1. What happens if the payment issued to me is not reflected correctly within the i-Neighbour system? May the Admins of the neighbourhood be able to rectify the issue? If necessary, residents may refer to the Management Team and request that the personnel in charge to make the necessary correction for any miscalculated amount. While for payment made through i-Neighbour Payment Gateway, an E-Receipt will be sent to the resident upon successful payment. Kindly check on the payment details and inform Management Team immediately if there are any mistakes discovered. 2. Is it possible for other residents to view my outstanding balance as well as my payment history in i-Neighbour? No. For privacy and security purposes, residents can only view their own unit’s Invoice and Account Statement. 3. Can my family members pay for my outstanding balance via i-Neighbour system since they are also the tenants of my unit? Yes. Your family members and tenants are allowed to proceed with the Invoice payment as long as they have successfully activated their account in i-Neighbour. 4. Is there any additional charges if I pay my maintenance fee through i-Neighbour’s payment gateway? 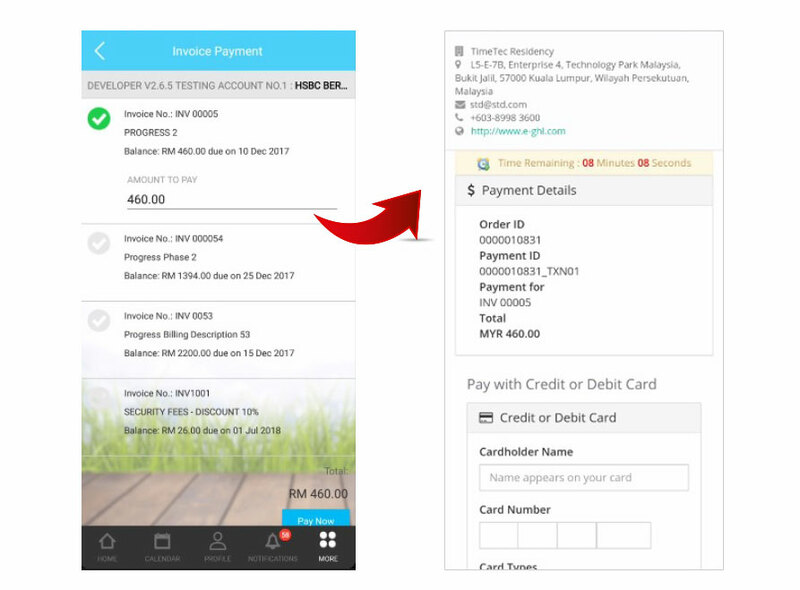 At the moment, the charges for i-Neighbour’s payment gateway is 2% for any credit/debit card transactions and RM1.50 for any banking transfer made. However, the rate is subjected to change and we will update the page once we’ve confirmed on the updated rates. 5. Will my outstanding balance be updated immediately in i-Neighbour after I paid in cash to the management office? Your outstanding balance will be reflected once the Management Team has successfully updated the payment into i-Neighbour system. Note that if you’re using i-Neighbour Payment Gateway, any outstanding balance will be updated immediately.